The Bluenose, a Canadian fishing and racing schooner, was launched March 26th, 1921 in Lunenburg, Nova Scotia. 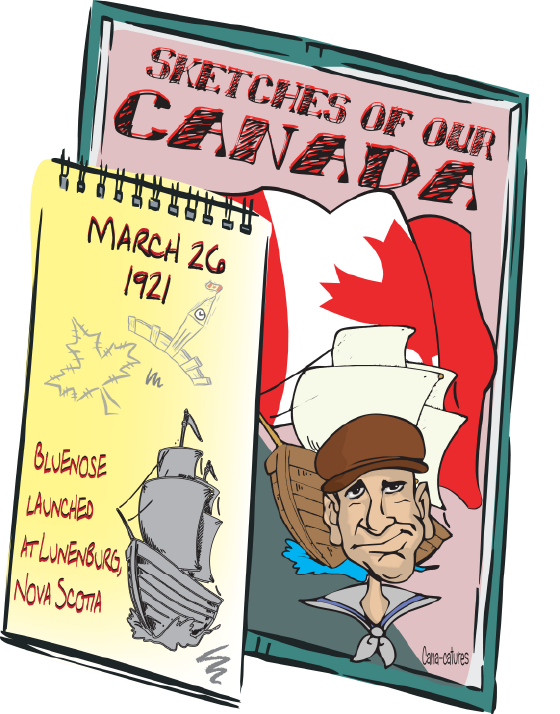 This Canadian History for Kids, Sketches of our Canada, looks at the great Canadian racing ship. The Bluenose became a provincial symbol for Nova Scotia and an important Canadian icon in the 1930s. The name “bluenose” is a nickname for Nova Scotians and has been since the late 18th century. 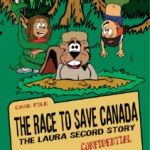 Another Canadian History for Kids fact is Nova Scotians are called Bluenoses because of the blue marks blue mitts left on the noses of fishermen and because of the exportation and planting of Irish Bluenose Potatoes. The Bluenose was designed by William Roué and built by Smith and Rhuland, and was launched at Lunenburg, Nova Scotia on March 26, 1921. It was christened by Audrey Marie Smith. Bluenose was built to be a racing ship and fishing vessel. The Bluenose was used for one season fishing on the Grand Banks of Newfoundland under the command of Angus Walters. The next year, Bluenose won the International Fisherman’s Trophy, a race held annually for the fastest fishing vessels in the world. Over the next 17 years of racing, no challenger, American or Canadian, could win the International Fishermen’s Trophy from her. Fishing schooners became outdated during the 1930s because they were replaced by motor schooners and trawlers. Despite efforts led by Capt. Walters to keep her in Nova Scotia, Bluenose was sold to work as a freighter in the West Indies. Loaded with bananas, Bluenose struck a coral reef off of Haiti on January 28, 1946. Wrecked beyond repair, with no loss of life, the boat was abandoned on the reef. However, there are still many Canadian History for Kids facts about The Bluenose. The Bluenose appears on the Nova Scotia licence plate and many different Canadian postage stamps. The fishing schooner on the Canadian dime, added in 1937 at the height of fame for Bluenose, was actually based on a composite image of Bluenose and two other schooners. In 2002, the government of Canada declared the depiction on the dime to be the Bluenose. Bluenose and her captain, Angus J. Walters of Lunenburg, were inducted into the Canadian Sports Hall of Fame in 1955, making her the first and only non-human inductee. In 1963 a replica of Bluenose was built at Lunenburg using the original Bluenose plans and named Bluenose II. The replica was built by the Oland Brewery. Bluenose II was sold to the government of Nova Scotia in 1971 for the sum of $1 or 10 Canadian dimes. The replica schooner is used for tourism promotion as a “sailing ambassador”. In honour of her predecessor’s racing record, Bluenose II does not officially race.